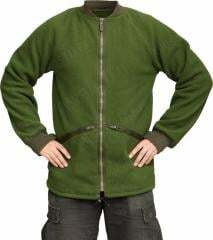 British fleece jacket of the Combat Soldier 95 system. The newer green model. A great liner for a shell jacket but can also be worn on its own. The Combat Soldier 95 was a complete overhaul of the clothing system and was based on layered clothing. 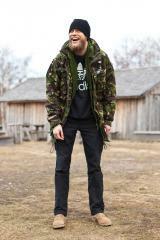 Originally made in DPM, the army soon realized that fleece clothes were not usually worn as the top layer, and thus were soon produced in olive green. 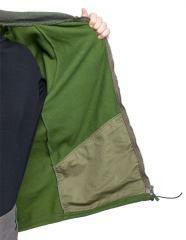 Well suited for civilian use, as green is a neutral colour and looks good anywhere, anytime. Fleece has poor IRR characteristics, so it would be a waste of effort to print it with any pattern: you'd be a shiny beacon as soon as someone uses cheater goggles. In some tests the reflective qualities were found to be the same as viewing a Scottish man's hairy arse with a thermal scope. Despite the classification as a liner, this feels a lot like a real jacket. Zipper closure on the front, two hem pockets, drawstring in the hem, and thumbholes in the cuffs. If it's not really that cold outside, this is a nice light walking out jacket. Fleece as a material is perfect for cold and wet places. 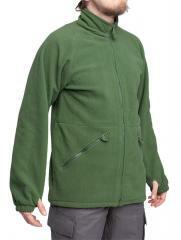 It is highly breathable, water repellent, quick drying and serves as good replacement for wool. Wash in 40 degrees Celsius. Air dry only. 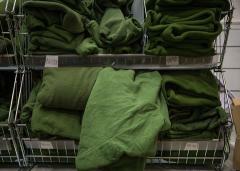 Fleece has one weak point: as it's made of synthetic materials, it catches fire rather easily. Sizes simply by user's recommended height and chest circumference in centimetres. Divide by 2,54 for inch conversion. Used, but in good serviceable condition. A few model variations exist, but the function is the same, so we don't differentiate. tässä vanhemmassa on villaresorit hihansuissa ja kauluksessa; uudemmassa mallissa on korkea kaulus, jossa vetoketju ylös asti ja hihansuissa ei uudemmassa mallissa ole resoreita, vain kuminauhakiristys ja peukalonreikä, mikä löytyy vanhemmanmallinkin hihansuiden resoreista. Vähän makuasia kumpi on parempi, ja voi olla merkitystä jos on villalle allerginen. Vanhassa mallissa ei ole korkeaa kaulusta antamassa suojaa. Minun makuuni vanhempi malli on mieluisampi, koska en pidä vuoritakissa korkeasta kauluksesta, vaan hoidan kaulan suojauksen muuten ja villaresorit hihoissa ovat mukavamman tuntuiset kuin pelkkä kuminauhakiristys. Ja tätä ei kannata hankkia kovin suurena, sillä koot ovat reiluja, minulla on vatsaa karvan päälle metri ja sovitin 180/96 puseroa ja oli juuri sopiva, hieman väljäkin ja pituuteni on vajaa 180. Eli max. niin ollaan hyvin lähellä optimi kokoa. Leka saisi yhden tähden lisää, jos nämä fleecet olisi lajiteltu uudempiin ja vanhempiin. Lämmin ja sopiva. Ostin omani vuosi-pari sitten ja sain uudenmallisen, missä on mukavasti kaulaa ja niskaa lämmittävä fleecekaulus ja kerrankin tilava kaula-aukko, mutta ranteita ikävästi kiristävät hihansuut. Hihansuun paksu poimuresori myös painaa ranteita, kun toimistossa naputtaa, eli ei paras siihen käyttöön. Nyt tilasin Särmän fleece-takin, jossa ei näytä olevan kiristäviä hiharesoreita, voi sopia paremmin toimistoon. For it's price this must be the best fleece jacket i ever brought, the wear on it was minimal. No-nonsense rugged construction. The only reason it did not get 5 stars is that depending on what you are looking for, it might lack some stuff like extra pockets and reinforced shoulders and elbows. I would recommend anyone to buy one. 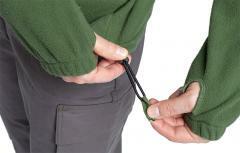 I ordered one to go with my S95 Windproof smock... nice and warm! The bad thing is, it was the newer version..so, I ordered the newer windproof smock! Looks like fleece that was washed too many times. One cuff is also not elastic anymore. Slightly wider than expected compared to other British stuff. For the price, it's an excellent fleece shell. Arrived in like-new condition, hardly seems used at all. Material feels comparable to a jacket I have from another outdoor supplier, which cost several times more. I received the version without two-tone knit cuffs (the 2nd + 3rd pics) and is far more "civilian" looking, which is great. Toimii loistavana välikerroksena erinäisten brittiparkojen (yllättävää) ja muiden kenttätakkien kaverina. Purchased mine and it is simply an amazing fleece! It is much lighter weight than my Canadian '82 Pattern fleece set that I use on Cadet exercises and it provides the same, if not more warmth. I want to get issued British kit but I have to buy it. For $20 this is a damn fine piece of versatile clothing. Mine came in decent shape, obviously worn more than a few times. One small well made repair and the elastic cuffs have given up a fair amount of their elasticity. 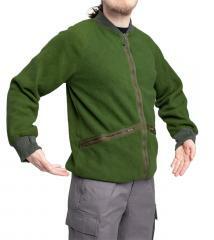 It would make a great underlayer or work shirt in dry, but cold and fire free environments. This is a solid fleece jacket. The fit is good and accurate, though the sleeves are going to be big if you're a skinny guy (which will matter less if you're going to use this as a layer rather than an outer piece). Great jacket! I purchased two of them, one has the cuffs and the other doesn’t but it doesn’t matter because both are very cool. I just purchased a third one which will be for my daughter to wear since Varusteleka had one her size. I have noticed the sizing is generous with these, just my opinion, if you are deciding whether to purchase one, do so because they are warm. Came i very good condition. 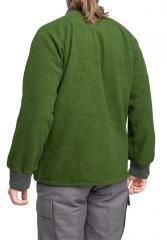 Heavy and thick fleece jacket. Amazing for such a low price. Nyt kohtaa hinta ja laatu! Lämmin valinta välipuseroksi. Omani on hiukan nuhjuisen, mutta kotoisan näköinen. Näppärä nippelitieto: taskut ovat tosi tilavat, sain helposti mahtumaan 0,7l pullon taskuun. Very nice! I'm 6'8" (2 meters) and the 190/112 fits almost perfectly. 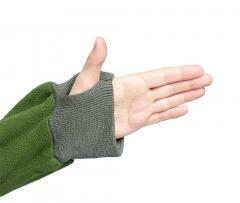 The arms are long enough that I can use the thumb-holes effectively, and it's VERY comfortable as a mid-weight sweater. 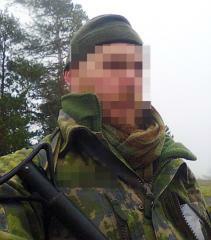 It is very difficult to find good military surplus that fits tall people. Luckily, I found Varusteleka!